Ron McDole spent 18 years in pro football, but he might be remembered most for his nickname. 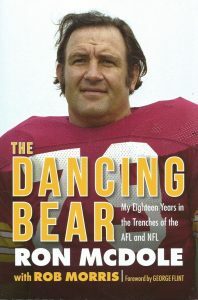 Sonny Jurgensen, a Redskins teammate in the 1970s, called him “The Dancing Bear” when McDole showed off his dance moves at a Washington nightspot. It stuck. Actually, that was an improvement over his last nickname. Some teammates in the 1960s called McDole “Bubbles” – after an elephant in the Buffalo Zoo. McDole was part of the Buffalo Bills from 1963 to 1970, and he was part of championship teams in 1964 and 1965. Then he was traded to the Washington Redskins, where he stayed through 1978. He holds the pro football record for most career interceptions by a defensive lineman with 12, a tribute to his quickness. McDole was in town as part of the Bills’ Alumni Weekend. He made some appearances locally to promote his autobiography, “The Dancing Bear.” Ron graciously sat down to share some stories about his playing days. Buffalo Sports Page: You started your career with the NFL’s St. Louis Cardinals in 1961 and the AFL’s Houston Oilers in 1962. How did you come to Buffalo to play for the Bills? Ron McDole: I came here from Minnesota. I signed a contract with them, but I was only there for the beginning of training camp when they released me. I went home. I had a job there as a teacher of industrial arts. Lou Saban called me on the phone. I had played against him when I was with Houston. He knew about me, and asked about the migraine seizures I had there (that led to his release by the Oilers). Lou asked what I was doing, and said he thought I could really help us. I came up for the team’s last exhibition game. I got on the train, and made some connections to get there. … All I wanted was a chance. I signed a contract with the league and the league rejected it. I knew what happened when it came back – the Oilers had sent a letter to the rest of the league not to sign me because of the migraines. Lou said, “This is stupid. You passed all the tests.” He called (owner) Ralph Wilson and said what had happened, and Wilson thought it was stupid too. Ralph told Lou to sign me. BSP: After some time on the offensive line because of an injury, you moved over to the defensive line for good in 1963. How did you finally get into the lineup? Ron McDole: Tom Sestak got hurt in a game. He got kicked in the head. I went on the field, and I was supposed to replace him. Then, someone said, no, go to defensive end. Sid Youngelman moved over to Tom’s spot. BSP: Lou Saban certainly ranks as one of the most memorable characters in Buffalo’s football history. How did you like playing for him? McDole: He was great for me. He knew what he was doing. He believed in me. One time, Tom Day was playing guard on offense as well as some time on the defensive line. He told us in 1963, “Tom, I’m going to put you at one defensive end next year, and Ron, you’re going to play at left end. You’re both going to have jobs until someone takes them away from you.” That was the start of that great defensive group, with Tom Sestak, Tom Day and Jim Dunaway. Sometimes we’d play a three-man front, and Tom would move to linebacker. 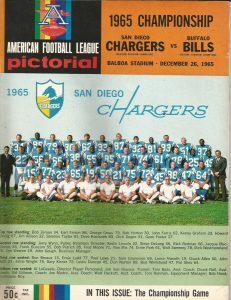 McDole helped the Bills win the 1965 AFL championship in San Diego – one of their all-time highlights. BSP: In those days, it was easier for the players to get to know the owner. Did you get to spend any time with Ralph Wilson? McDole: Ralph was the greatest friend in the world. Most of us got along well because he was involved in the team. You could talk to him. BSP: The salaries obviously have changed over the years. It sounds like every dollar was precious back then. BSP: There’s always been a debate about how the American Football League teams might have done against teams from the National Football League. Was there a point where you thought you could play with those guys? McDole: When it came to playing the game, the only big difference was that the NFL ran the ball a lot. That’s the way they developed. We had quarterbacks who passed the ball around. The only thing that was hard for us is that we didn’t have a lot of money. But we all thought we could play with them. BSP: After winning the two titles, the Bills went straight downhill and only won one game in the 1968 seasons. That’s when they hired John Rauch from the Raiders to coach the team. He’s mostly remembered as the coach that tried to make a decoy out of O.J. Simpson. McDole: John made the mistake that a lot of coaches make. When they get a job, instead of taking what the team did best and improving on it, they try to start over. He tried to make us like Oakland. And we weren’t Oakland. We didn’t have the personnel. BSP: You were traded to the Redskins for a couple of draft choices in 1971. Later that summer, Rauch appeared on a local sports talk show and criticized some of the veterans on the roster, including you. It created a firestorm around here. BSP: You played eight years in Washington, even making a Super Bowl against the Dolphins. Many of those years were spent under head coach George Allen, another legendary coach. That made you part of the “Over the Hill Gang” in everyone seemed to be over 30 years old. McDole: Washington was a great place to play, and a great place for me. George used to love veterans. He said he didn’t have to coach those guys because they knew what they were doing. BSP: While you were on the Redskins, you played with defensive back Mark Murphy, who grew up in Clarence. Did you get to know him? McDole: I knew him real well. One time we were in training camp. Now in those days, there wasn’t a lot of equipment. So if you needed a pair of shoes, you had to beg for them or buy them yourself. Mark had big feet – size 14. Now our defense was really close. He came to me one day at training camp, and he had a pair of shoes that were falling apart. They sent him to me because I wore 14s. He was so polite. He said, “Mr. McDole, I know you don’t know me.” I said, “Aren’t you the guy the from the Buffalo area? He said, “Yeah. I’m sorry to bother you, but I need a pair of shoes.” I said, “They didn’t give you any shoes?” He said, “No, and they said you wear 14s.” … I gave him a pair of shoes, and you’d think I gave him a million dollars. He thanked me for the rest of the season. BSP: You finally retired after the 1978 season at the age of 39. What did you do with your life after that? McDole: I basically was in the woodworking business. I was educated as a shop teacher. I was always around that. I enjoyed working in it. I had a library manufacturing company. I did it full-time. BSP: Now, you’re an author with a book out. It’s been almost 40 years since you lined up on the field. As I understand it, your family urged you to get the stories you’d been telling them for years on paper. How did you like the experience? McDole: It’s fun going back. It’s good to see what has happened, to look back at how guys turned out. You still have to live your life after football. BSP: You came back to Buffalo this week to sell some books, which is a chance for the people here to tell you about how much those teams from the 1960s meant to them. But, I’d bet it’s great to see some of your old teammates again. McDole: The players were always fantastic, and we were all so close. We were involved in a lot of things, like a golf tournament. Everybody tried to help each other out. The relationships were always great. I used to host a Halloween party every year here, because you need something like that to relate to each other. And we kept having success, which was great. That was the one thing they could never take away from us.